Taste test: These came completely out of left field for me. 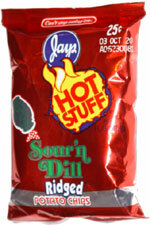 I've never heard of a hot pickle chip, and I really had no idea what to expect. Well, when you first bite in, you get tons of great pickle taste, and very quickly after that, you realize that they're really, really hot — hot enough that I went running to get some water. If you're weak, you may not be able to stand this, but if you like a good challenge and are willing to try something hot, these are just great. You probably will need to have a beverage handy, but these are definitely a snack to seek out. Smell test: Smells like pickles. Good. 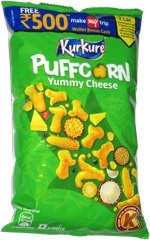 This snack was discovered by Jeremy at Gold Rush Food Mart on Chicago Ave. in Chicago. Review published .